Rabobank’s Wes Lefroy addressing the 2018 NTCA conference in Alice Springs. STILL unsure what blockchain is, or what it potentially means for the Australian beef industry? 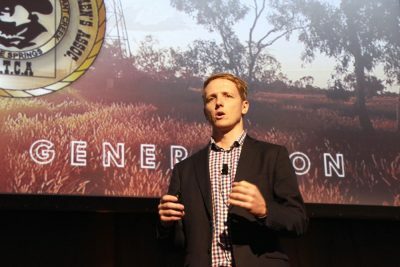 At the recent Northern Territory Cattlemen’s Association conference in Alice Springs, Rabobank agricultural analyst Wes Lefroy offered several insights into how the digital technology is already being applied to agriculture, and the potentially transformative role it could play in Australian beef supply chains in future. It’s a relevant and pertinent message at a time when more beef stakeholders, from production to processing to retail, are aligning into customer-focused value-chains, with the view to sharing performance data and premiums captured between all stakeholders involved. Mr Lefroy described blockchain as a digital platform that stores and verifies transactions between users. Transactions, or ‘blocks’, are recorded and stored on a digital ledger, which is replicated on a wide network of computers. This makes the chain of transactions, or the ‘blockchain’, extremely difficult (some say impossible) to tamper with or change, creating a digital record that is very secure. This in turn means there is less need for trusted third parties to facilitate transactions, reducing costs and streamlining the transaction process. Blockchain was created in 2009 to underpin the cryptocurrency Bitcoin, but is increasingly being applied as a technology in its own right to a wide range of alternative applications. As Mr Lefroy pointed out to the NTCA audience, it can be used to facilitate the transfer of commodities such as beef, wool, grain or fertiliser quickly and efficiently. 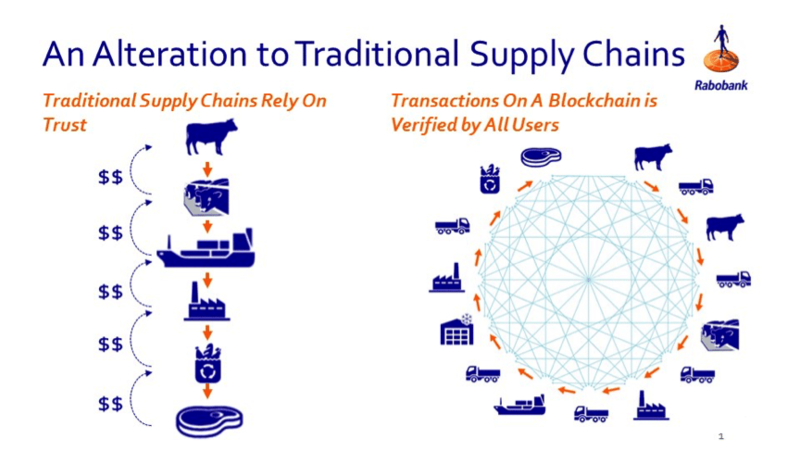 Blockchain helps to assure the traceability and provenance of a product, can lower counter-party risk by ensuring finance is available before a transaction proceeds, and can facilitate virtually instant payments between supply chain stakeholders. In countries such as China food fraud is a major concern after a series of food safety scandals involving locally produced food, such as the contamination of infant formula with the toxic industrial chemical melamine. As a result imported product from safety-assured sources such as Australia is highly valued. The transparency and tamper-proof nature of products underpinned by blockchains can allow consumers to buy with confidence knowing the product they buy is what they think it is – ie Australian beef, not a lower priced substitute of unknown origin packaged and sold as Australian beef. Mr Lefroy said trends favouring the use of blockchain technology included the rising amount of online food purchases, which is giving consumers greater access to products with their desired attributes, and the increased interest consumers now take in the provenance of their food. “There are other technologies and tools that can trace products through the supply chain, but the real strength of blockchain is the strength of verification of that information along the supply chain,” he said. This is not a technology of the future, but one that is quickly advancing and might be here sooner than we think. Last year IBM partnered with Nestle, Unilever, Walmart and other food giants to use blockchain to improve food safety. In March the world’s second biggest e-commerce platform, JD.com, announced a deal with Australian exporter InterAgri to use blockchain to sell beef from Victoria and Tasmania to its multitudes of online customers in China. “We’re increasingly implementing blockchain-enabled traceability solutions to give consumers confidence that they are buying safe, reliable products for their families,” JD.com’s CTO, Chen Zhang, said of the deal. Rabobank itself executed a proof of concept trade in commodity finance last year with blockchain startup Agridigital, through which a graingrower was paid instantly on delivery of his grain. Australian bulk grain handler CBH also partnered with Agridigital to pilot blockchain technology for tracing Australian oats through the supply chain. A traditional centralised supply chain, as shown on the left of the above slide, follows a series of vertical interactions between the various stakeholders, with transactions from producer to feedlot, feedlot to processor, processor to wholesaler, wholesaler to retailer, and finally to the end customer. Transactions between each stage are verified by a trusted third party such as a bank. The flow of information up and down relies upon the accurate passing of information between stakeholders and depends on trust from stakeholder to stakeholder. Information can still be altered or communicated inaccurately along the way. In a blockchain-driven model (as shown at the right), the supply chain is decentralised with all stakeholders connected via the blockchain network. Transactions and information is stored and verified by all users, and all stakeholders are equally connected. “When the physical commodity moves along the supply chain, everyone on the network is linked together on that blockchain, bringing transparency, provenance and reduction in counter party risk,” Mr Lefroy explained. However, it could not work without the full participation of all stakeholders. “For instance if we don’t have the processor, or if we don’t have a feedlotter, or we don’t have an exporter on the blockchain, essentially that is a black hole undermining the integrity of that blockchain,” he said. Who will drive blockchain for producers? Mr Lefroy said there was a lot being done to progress blockchains at downstream levels of the value chain, such as in e-commerce companies and supermarkets, but there were still questions as to who would or should drive blockchain at the production end. “Who is going to drive that agenda for producers? Who is going to make sure producers have the ability to operate in these markets?,” he asked. Mr Lefroy said blockchain opened the door to direct interactions between supply chain stakeholders. The feedback available through blockchain meant producers would be able to identify opportunities that weren’t previously identifiable, and move from being supply driven to being more reactive to demand. Mr Lefroy said blockchain was not a silver bullet or free of downsides, but he was confident that over time the benefits it offers would outweigh the initial costs. “In our view we will see producers go from being supply driven to more demand driven and a continued emphasis on data collection to strengthen the production story,” he said. I understood that one can prevent fraud by using Block chain. But, I didn’t get how will this help in preventing tampering of a physical product. for example – If someone replace the genuine beef inside the packet with cheap beef but the packet and the information(may be barcode which tracks the info of blockchain) on the packet not tampered. Then, how will customer know that they got genuine product. There are different types of blockchain. A ‘permissioned’ blockchain allows you to set permissions on who sees the transaction. I’m all for allowing the buyer to see what he is getting for his money – where it came from, it’s provinance, it’s supply chain inputs, it’s changes from a live animal to a carton of boneless beef. It’s integrity! I’m all for reducing costs of production and delivery costs to the buyer. I’m all for eliminating delays, mistakes, inaccuracies, misrepresentation, fraud and cheating. But why would you want to allow the producer see what price the exporter got for a container load of his boneless cow beef CIF New York. ?